In light of recent discussion, the quality of questions on Stack Overflow is dropping rapidly, and as such, I find myself being more of a critic than I used to be a year ago. Questions which hardly show any effort on the part of the asker are becoming more and more prevalent, oftentimes just consisting of a couple of lines of code with the obligatory "can anybody help me?". These questions do not provide a specific description of the problem experienced, and more often than not lack a descriptive error message, or approaches already attempted by the person asking. Pretend you're talking to a busy colleague and have to sum up your entire question in one sentence: what details can you include that will help someone identify and solve your problem? Include any error messages, key APIs, or unusual circumstances that make your question different from similar questions already on the site. These questions usually boil down to the person asking not wanting to put in the effort required to solve his problem, and asking others to do his work for him. Though that may be what this website has always (kind of) been about, I find myself downvoting these questions and providing them with comments pointing out why I downvoted it and how the question could be improved, which is often along the lines of "what have you tried already? ", "what is the error you are getting?, etc. However, I often get a lot of flak for posting comments like that from people who are willing to do the OP's homework, and answered his question. This makes me question if I am doing the right thing, or maybe I'm too harsh on these people? Should I keep downvoting these poorly written questions, or am I becoming a grumpy old man who's trying to stick to traditions of a time long past? When is it "OK" to downvote a question, and when is it not? Please stop being a care bear, and proceed to be harsher at once. Poorly written question? Downvote and move on. Feel like puking in the face of the OP's wall of hideous spaghetti code? Downvote and move on. Did the OP obviously forego googling? Downvote and move on. Did the OP obviously forego reading the documentation? Downvote and move on. Is the OP confusing Stack Overflow with a free version of Mechanical Turk? Downvote and move on. The list goes on, and on, ad nauseam. As things stand, perhaps 99% of the questions on certain tags merit a downvote or ten. Browse your favorite tags, open a dozen questions in new tabs, and don't even try to parse the question if it's obviously junk: downvote and move on. For the few that don't immediately qualify for a down vote, actually scan through the question to pick up an overall impression. At the first hint of incompetence, downvote and move on. By incompetence here, I mean not demonstrating the minimum amount of effort you'd expect from a co-worker who shows up with a question. If he obviously went through the documentation, googled his problem, perhaps tried a thing or two, and now needs a hand, some direction, or a second pair of eyes, that's absolutely fine and that's what colleagues (or Stack Overflow enthusiasts) are for. Anything short of that is broadcasting the message that you're expected to do his work. On the right tags, you'll plough through your 40 downvote limit per day in a matter of minutes. Moreover, a question ban will only kick in if an OP's questions are sufficiently downvoted. So downvote away, wide and large, as viciously as you can, without fear or mercy. Asking us to do ... anything, with no attempt to do so oneself. The question can be answered with a copy-paste from the manual. The question can be answered by copying directly from one of the results in the first page of a Google search of the title (or similar). It takes you more than ~10-20 seconds to get a basic idea of what the question is asking. The language in the question is such a mess that you have absolutely no idea what's going on. It might not even be a programming question. Perhaps the guy's trying to make coffee. Perhaps he's trying to make contact with some aliens. I'm fairly lenient on the language aspect - not everyone is particularly good at English. If I can edit it to fix most language issues, I'd rather do that. The question is underspecified to such an extent that you'll have to write a book if you were to consider all the possible assumptions you could make in trying to answer the question. One or two unclear things doesn't usually cause me to downvote, but I might vote to close it instead if those things makes it impossible to answer the question. I consider downvoting on the unclear aspect a more extreme version of voting to close as unclear (although the reverse may be true for some), but I often vote to close as well when downvoting for this reason. The question is so fundamentally wrong for this site that you have to wonder what OP was smoking. This is probably more of a repetition issue - just a single off topic question here and there might not be downvote-worthy (arguable...), but if one can't be bothered to post on the correct site or conform to the on-topic guidelines, one really should help oneself to a few downvotes. You strongly feel that the question wouldn't provide any / much value to anyone else, for whatever reason (but there isn't a close reason that applies). I personally feel "Is my answer right? "-type questions (e.g. complexity analysis of functions, binary search tree insertions by hand) are often not particularly useful, so I may downvote them. And absolutely DO NOT comment without downvoting where a downvote would've been appropriate, hoping OP will fix their issues eventually, or that those one or two downvotes already on the question is enough. Questions with a few downvotes that get fixed can easily pick up enough upvotes again to reach a positive score. And while some may change due to a few "What have you tried?" comments on their question, the vast majority is unlikely to, where-as a handful of downvotes is way more likely to change them, or at least get them off the site quick enough if they don't. Although, by all means, downvote and post a comment if you wish. But I personally feel that "This question does not show any research effort; it is unclear or not useful" is pretty self-explanatory in most cases, although this isn't really the issue up for discussion here. Don’t be afraid that you’re going to reject too many people and you won’t be able to find anyone to hire. During the interview, it’s not your problem. Of course, it’s important to seek out good candidates. But once you’re actually interviewing someone, pretend that you’ve got 900 more people lined up outside the door. So when it comes to objectively evaluating a question you should be ruthless and free of any moral constraints. Use downvote and flag the question for closure. If you just downvote nothing will happen and we'll just see a bunch of downvoted questions. If you flag it there is a good chance that it will be closed and it will cease to pollute the list of questions with noise. There is an important thing though: you should comment on the question. This should be a no-brainer but people often just fire and forget. If you don't tell them what the problem is they might just get angry and ask again or something like that. On the contrary if you comment and tell them what was the problem they get feedback and can improve (if they want to of course). In my case I often short-circuit if I see any of these patterns and downvote+flag+comment on the question accordingly. I think that it is OK if you have a file with the standard comments for every pattern. How to pass arraylist of custom class in intent using Parcelable interface ? I have arraylist having objects of custom class now i want to pass this arraylist from one activity to another activity. Please help ! Thanks in advance. This question in its current form is not answerable, consider editing it or reading the FAQ. I'm newbie in coding and i do know that both programming language supports OBJECTS but can anyone explain what is the major difference in term of object in both languages. Standard answer: I think this question can be googled rather quickly. If you don't understand what the problem is please read the FAQ. This is a homework that I want your help in order to do it! Thanks all!!! Hope it is not difficult to give me instructions how to solve it or to give me some parts of code to start with! Then he goes on and copy-pastes the homework and the instructions. Standard answer is: This is a question and answer site if you are confused please read the FAQ. If you want someone to solve your homework hire a consultant but we are not supposed to solve it for you. After all it is a homework assignment in the first place. iPhone (on Mac) Android (on Windows & Mac) PHP/LAMP Model ( on Windows & Mac) Flash/ActionScript (on Windows & Mac) Thank you. Standard answer is: On this site we are supposed to provide concrete answers to concrete questions. Suggestions are not part of its agenda. If something is not clear please read the FAQ. How does parameter passing work in java? It has been answered like 1024 times. No reason to answer it again. You don't need to comment since after flagging it a comment will appear with something like "possible duplicate of..."
Downvoting/flagging is not a personal attack. You evaluate a question and react to it. This is supposed to be objective only considering the question itself not the user. Sometimes you will feel the need to answer the question. Don't do it. It will just lead to a proliferation of new questions with zero worth and you will end up cleaning up the mess. If someone gets fed up and starts to attack you personally then stay objective and link to the FAQ or explain the problem again. Imagine yourself in their situation. Stay polite and use the flag function. Don't be afraid to comment. Voting anonymously is easier, I know but if you don't provide a pointer to what the problem is you leave the user without any guidance. Probably for different users different things are the "right thing". People have different tolerances towards badly posed questions. Some will require less. You have a right to downvote, but others have a right to answer questions even if they are downvoted. I would even go further and say, as long as there are others willing to do the OP's homework, well, it's their business, isn't it? It doesn't affect you and how you see the question. I would still downvote the question (but not the answer). Should I keep downvoting these poorly-written questions, or am I becoming a grumpy old man who's trying to stick to traditions of a time long past? When is it "OK" to downvote a question, and when is it not? It is okay, when it is according to the guidelines. Your way (the traditional way I assume) is not worse than other ways. Just continue, but stay open just in case a usage pattern emerges that might be better. 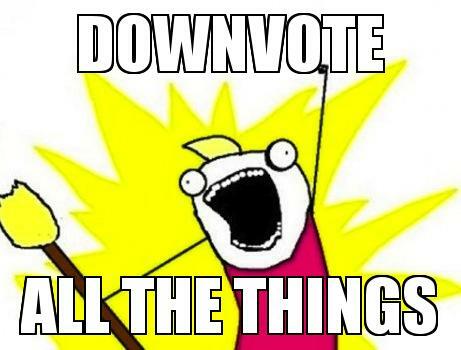 Lately I wonder if downvotes and close votes are not strongly correlated and therefore partly redundant. One could imagine that there would be no downvotes, but only upvotes or close votes. In this case the discussion would be more to the point: to close or not to close. Anytime you feel like it basically. But a little more seriously: Last year, many close options for reviewers were removed. In their place, the use of the downvote was recommended in many of these cases. Therefore, anytime a question shows what you judge as lack of quality, downvote it. Really the question for the discerning user is when should a question be closed as well. That is the question which requires more explanation. If you feel a question needs a-downvoting, downvote it. As you might have noticed in a year passed, your question has slightly missed the goal. As you can see, voting doesn't affect the quality of the site content. Even slightest. Not to mention that the "move on" attitude from the most upvoted answer is making it rather worse. Let me suggest you to rethink the problem and come up with another question, that address your concern of the quality of the site content more directly. Or, judging by the most upvoted answer, you may wish to reconsider the initial concern itself. If the community is only concerned in moving on, not making a good site - why to stand on its way? Get your reputation points and move on. There are many lovely badges to earn. I think the biggest problem with StackOverflow is that it doesn't quite know what it wants to be. Is it a Q&A forum for all programmers who need help or is it a repository of the best programming answers on the web? Programmers needing help come here for the former, SO veterans who run this site believe in the latter. If SO wants to pursue the latter then it should simply put a disclaimer when asking any question: "Warning, we will only accept your question if we believe it is worthy of answering!" See this is a real problem, because just like with email, a very low percentage of readers will read a large article. Analogously, an email is scanned briefly by the majority of users and so is a message posted here on Stack Overflow. There is little sense in writing reams of detail of events leading up to the question, in the initial question. It is actually wrong for Stack Overflow to be instructing users to write long detailed initial posts of things you tried leading up to the original post. The reason is the same reason you would not generally actually read a long email that you get from someone in its entirety. What happens is that the skimmers of the post will not see what was written because the trees obscure the forest. This is how humans need to operate. We need to use brevity, for good reason. We need to be OK with that when other people use brevity, and not automatically start to make negative assumptions about the work ethic or whatever of the counterparty. Not the answer you're looking for? Browse other questions tagged discussion down-votes voting downvote-reason . Can you explain why my question was downvoted? Is this a bad question or SO users did not read the question clearly? Is it OK to downvote because I don't like a guy/gal? Why downvote a simple question about a piece of code that is not working? Why is the community so vindictive about theoretical questions? Should we downvote off-topic questions as well as vote to close? Why are people so quick to downvote questions? When to edit code/links into snippet?